The Aussie Aussie Aussie series have a winner with Emily's Sheepdog (UC Publishing/ Blake Education). Written by Tracey Slater, and illustrated by Phong Lam, it's about young Emily, who wants a dog of her own to play with. A poodle is her preference. But Dad says a farm only has room for working dogs. So Emily sets about creating a poodle with the help of a lamb called Poddy. Books don't have to be scary to have conflict and tension. Anyone who has ever longed for a pet will understand Emily's dream, and her determination to have the poodle of her dreams. As readers, we empathize, thrill to her plan and worry when she lies to the dog show judge. Can Emily's dream of having her very own sheep dog possibly work out? Tracy Slater uses simple but effective words to describe Emily's adventures, and Phong Lam's black and white cartoon-style art work adds even more humour to this fun story. It would appeal to children aged from seven to ten years. 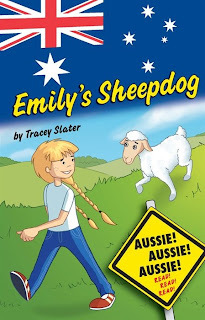 Although Emily's Sheepdog is set in Australia, I think boys or girls, in any rural or urban setting will understand and relate to both Emily's dream, and her creative ideas.